Being a food writer means I’m also a huge fan of afternoon tea, especially when it’s done properly. Last weekend I was invited to stay at the brand new delux Park Regis hotel in Birmingham. 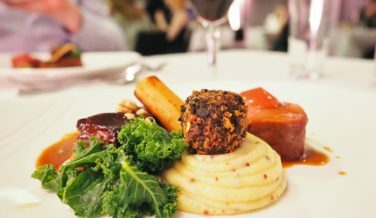 It’s located at the top Broad Street and boasts two new restaurants and a cocktail bar towering high above the city skyline. As far as hotel decor goes, the inside interior is stunning. My review of our stay, what we ate and how well Park Regis treated us will be posted shortly, but first… I have a wonderful competition to share with you. We were offered to try the Classic Afternoon Tea (£24) and it’s just a bit extra (£29) for a glass of prosecco. We were seated in the hotel bar near the window and were given a mass selection of fruit, green, herbal and normal teas to choose from. Looking back, the ‘Smokey Russian Caravan’ tea sounded adventurous and I really wish I had tried it. The restaurant have carefully selected a variation of drinks to compliment the afternoon tea so what could possibly go wrong? We sat on the most beautiful velvet chairs and drank from crisp white tea cups with saucers. The first course served is a single, bite-sized prawn amuse bouche. The food experience is credited to Britain’s culinary heritage and the chef perfectly executes a combination of finger sandwiches, warm scones and sweet pastries. All food is prepared and served fresh each day. They also serve a ‘Gents’ Afternoon Tea’ – pulled pork, steak sandwiches, and battered makerel instead of dainty finger sandwiches. A children’s style tea (£9.50) is also available and I would love to see how they present that. If you happen to go along with your child, please do take pictures and let me know. As a gift to my readers, I have teamed up with Park Regis to give YOU the chance to experience a luxury Afternoon Tea treat for 2. Anyone from the UK can apply and you must enter via the Rafflecopter box below for a chance of winning (for example, leave me a comment or follow me on Twitter). I will contact the lucky winner on April 20th. Good luck!